FAA officials say the Airbus A333 returned to Hartsfield-Jackson Airport shortly after takeoff when smoke was spotted billowing from an engine. 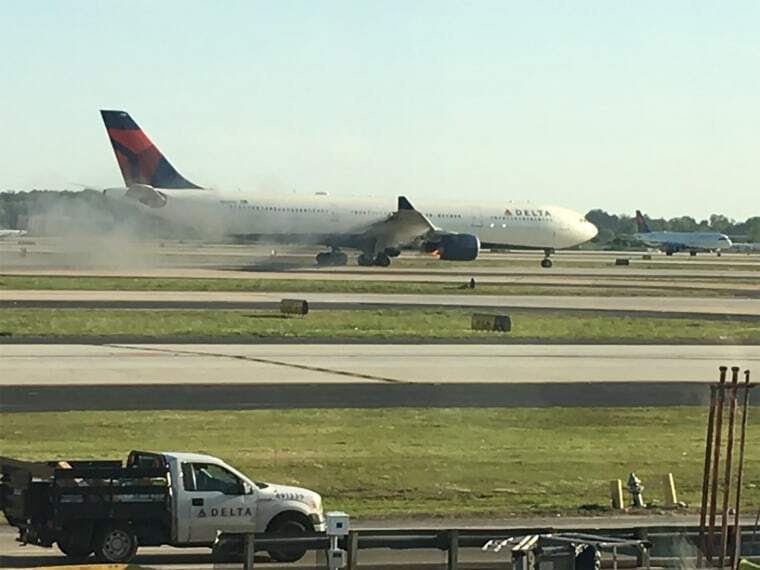 A Delta Air Lines plane made an emergency landing Wednesday at Atlanta's Hartsfield-Jackson International Airport shortly after takeoff when smoke was spotted billowing out of its right engine. The airline confirmed that Delta Flight 30 from Atlanta to London returned to the airport "after an issue with its No. 2 engine" minutes after taking off at 6 p.m.
"The flight landed without incident and airport response vehicles met the aircraft upon arrival," Delta said in a statement. "The airplane was towed to the gate, where customers deplaned through the jetway and will be accommodated on a different aircraft. The safety of our customers and crew is always our top priority and we apologize to our customers on this flight." The scare on the Airbus A333 comes just one day after a passenger onboard a Southwest Airlines flight was killed after one of the plane's engines failed, damaging the fuselage and shattering a window, forcing an emergency landing in Philadelphia. On Wednesday, the situation turned out a lot less dire. "The plane almost immediately arrived on the same runway it departed from, Runway 27, and was met by firefighters who hosed down smoke coming from the engine," Hartsfield-Jackson spokesman Andrew Gobeil told NBC News. Video on social media shows what appears to be a fire in the engine being extinguished by fire crews on the tarmac. Gobeil said there were no reports of injuries, and the passengers disembarked from the plane approximately an hour after the emergency landing. FAA officials said the agency was investigating the incident.